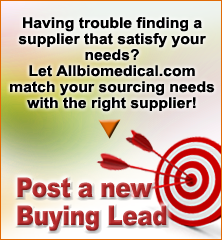 Sourcing helper is a brand new service on Allbiomedical.com where we match buyers' sourcing requirements with the right suppliers. Buyers must be registered Allbiomedical.com.com Members and have posted a clear and detailed Request for Inquiry Form. Brief Description: we will participate on a governmental therapy equipments tender.pls send your e mail to send u the details.